CryptaFlix ™ is a free video player for Windows with encryption capabilities for DivX, XviD, and other AVI formats including most MPEG-4 movies. Protect your video collection from unauthorized viewing with password protection using the Advanced Encryption Standard (AES). Organize your movie play lists using the movie bin and thumbnail display features. 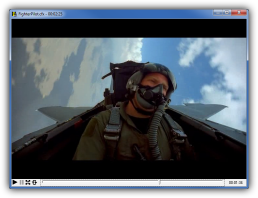 Plays AVI, MPG, and other video formats with the applicable VFW codecs installed. Encrypts AVI videos (including DivX and XviD) using state-of-the-art AES encryption with 256-bit keys. Videos are decrypted on-the-fly directly into memory while playing. No temporary files needed. Create self-playing movie files that can decrypt and display themselves without requiring a separate viewing program. Includes file navigation tree and a movie bin for sorting and saving movie lists and viewing movie thumbnail images. Password Queue allows a single password entry to open up multiple encrypted movies during a single session. Delete/Wipe function allows permanent erasure of source files after encryption. Windows 98, ME, NT, 2000, XP, Vista, 7, or 8. Windows Media Player 6.4 or later. Video for Windows (VFW) codecs and applicable audio codecs for the video files you wish to play (DirectShow codecs are not used by CryptaFlix for video playback). DirectX 8 or later (for non-AVI thumbnail captures). The software includes an installation routine that will place all the program files into a directory of your choice and will add the appropriate shortcut icons to your start menu. No device drivers or other runtime modules will be modified or added to your system directories. No adware, spyware or any third-party programs will be installed on your computer. You may remove the program at any time with the built-in uninstall routine. Exe format (cfxsetup.exe, 1.3 MB). Download and run to start the installation. Program changes are listed in the revision history file. Frequently Asked Questions - A FAQ file for CryptaFlix is available here.